On March 27, 2015, I had the privilege of attending the Action/2015 event hosted at the Telangana State Department of Juvenile Justice, Saidabad for promoting interaction between the Child Rights Clubs and Juvenile Justice functionaries of Hyderabad District. Both boys and girls gathered from four different local government schools in Hyderabad, totalling approximately 40 adolescent participants. During the morning session, Fr Thomas Pallithanam SDB addressed the children, fervently reminding them to exercise their citizenship today, not waiting for tomorrow. Fr T.D. John SDB then guided an interactive group discussion of the 42 Human Rights as identified by the United Nations. Boys and girls divided into groups, collaborating in their development of slogans to represent the four classifications: protection, survival, participation and development. The group to which I belonged cooperated effectively together, searching for the words to represent themselves and deliberating before a final presentation. All of the groups vocalized pride in their slogans, singing to the rest of the participants and demonstrating a budding comprehension of the 42 rights. Earlier, Fr Palli also encouraged the celebration of difference as well as a shift in ideology, from competing for ``first place`` to pursuing one`s personal best, competing only with themselves. During the afternoon session, representatives from the CWC [Child Welfare Committee], DCPU [District Child Protection Unit], SJPU [Special Juvenile Police Unit], and JJB [Juvenile Justice Board] arrived to engage in a discussion with the children pertaining to the issues they recognize among their peers. 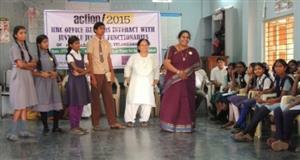 The Childline team of Hyderabad was also present. I was impressed by the active participation by the girls and boys as they capitalized on an opportunity to articulate their concerns. They addressed the representatives diplomatically and questioned when such injustices would be corrected. I was equally pleased to see the Human Rights Club office bearers and Juvenile Justice functionaries` involvement in the discussion, all refraining from a defensive stance and addressing the children as their counterparts. I observed such style of communication to directly model for the children their human right to participation. Some of the subjects the children addressed were classmates dropping out of class to pursue labour at nearby hotels as well as girls under the age of 18 entering into marriages, prior to being recognized as legal adults. Other participants spoke about children around them disappearing after being kidnapped. When the discussion concluded, I accompanied the children as we toured one of the government houses designated for boys. They asked questions as a staff member guided them through the common living areas for the residents, providing a brief glimpse into the life of children not distant from themselves. It was awe inspiring to witness such demand for justice, from children and for children. What started in the morning as 40 individual voices, throughout the course of the day developed into a single sound, a collective message. The boys and girls spoke for both themselves and for the young who have been either temporarily or permanently silenced in a fight to defend their same rights. For this small group who represent a larger population of developing activists, they serve as an example not just for their peer group but for adult men and women who do not look down but see eye to eye.